What else can be improved besides lighting as well as adding wind, new shadows and a bunch of everything else that changes Minecraft BE​​ very much? You can use the latest change by downloading the Better Water Colors Texture Pack. A very special color of water depending on the biome is the ultimate goal for this pack and it coped well with it. From the game experience, you know for sure that water is almost always the same anywhere in your world, but now it will look completely different depending on the surrounding climate. For example, if you find a river or a lake in a forest, you will see greenish water, but if you climb far and find icebergs there is turquoise water. This is a wonderful texture pack with which the realistic seasons are optimally combined. Add the Seasons Addon for Minecraft PE and nature will become like the one you can see in North America. How to install Better Water Colors? 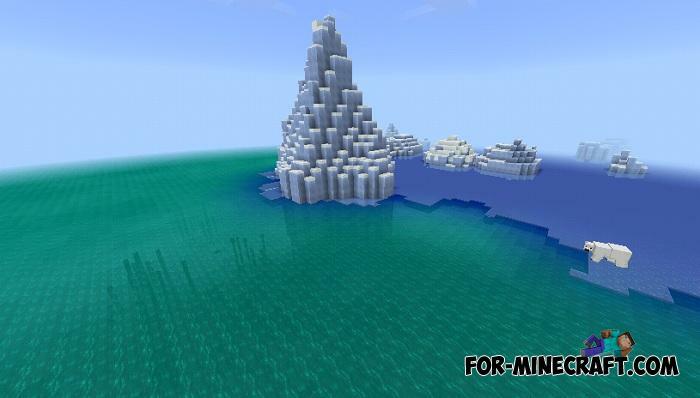 Mint texture pack for MCPE 1.5+Boost FPS with this texture pack released for the latest versions of Minecraft PE..